Companies spend millions of dollars on data-gathering initiatives, but few are successfully capitalizing on this data. Moving from data collection to profitable results requires an understanding of the new metrics of customer data, the ability to forecast and develop a business rationale based on identified data patterns, the skills to formulate concrete recommendations, and the expertise to articulate a strategic business vision based on customer data. Customer Analytics brings data to life, going beyond the numbers to show you how to link them to your strategic initiatives. Instead of taking a deep dive into the math, you will learn how to convert numbers into actionable insights. You will also discover how best to convey your data-driven recommendations, effectively become the translator between the data analytics team and the C-suite. Academic Director Raghuram Iyengar says Customer Analytics will help participants make sense of their customer data and strengthen their decision-making. Customer Analytics brings together a powerhouse team of Wharton faculty from operations, information, and decisions; legal studies and business ethics; marketing; and statistics. They guide participants through the most current theories and best practices for designing and implementing a data-analysis strategy, while continuously linking the learning to your real-life challenges. 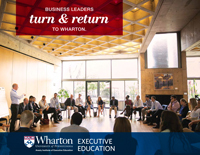 The exceptional multidisciplinary learning journey will also give you a front-row seat to the powerful research and thought leadership of the Wharton Customer Analytics Initiative (WCAI), the world’s preeminent academic research center focusing on the practice of data-driven business decision-making. This offers an advantage you will not find anywhere else. Each session includes a short, highly interactive case study that allows you to immediately apply new concepts and link them back to your organization. Class discussions will offer a window into applications for a diverse group of participants who represent a wide range of industries, geographies, and roles. Descriptive Analytics examines the different types of customer data and how they can be visualized, ultimately helping you leverage your findings and strengthen your decision-making. Predictive Analytics explores the potential uses of the data once collected and interpreted. You’ll learn to utilize different modeling tools, such as regression analysis, and estimate relationships among variables to predict future end-user behavior. Prescriptive Analytics takes you through the final step: formulating concrete recommendations based on your data. These recommendations can be directed toward a variety of efforts, including pricing and social-platform outreach. A distinctive highlight of Customer Analytics is engaging in discussions with expert practitioners from a range of industries who have experience with both business-to-consumer and business-to-business customer models. These practitioners will reveal their real-time challenges and best practices, sharing their experience with the three most common hurdles of analytics strategy — tools, talent, and metrics — discussing what tools to use when, how to build analytics teams, and what to track about your customers. The Customer Analytics Capstone Project gives you the opportunity to apply what you've learned about how to make data-driven decisions to a real business challenge. Working in groups, you will leverage skills within your group to identify how successfully use data to create cutting-edge, customer-focused marketing practices. In these sessions, groups will use real-world data to apply customer analytics to marketing challenges, starting with data collection and data exploration, and continuing all the way to data-driven decisions. After completing your group project, you will be asked to reflect on how to identify scenarios from your own company or business, where there could be benefits from the innovative and effective data-driven practices learned during the week. Senior-level managers in both B-to-C and B-to-B organizations who are responsible for influencing business decisions across marketing, finance, operations, and strategy will benefit from Customer Analytics. Specific job titles include CEO, CMO, CTO, COO, and digital officers. Additionally, executives who are responsible for data science and the teams that collect data, those who are beginning to use available data to inform strategy and operating decisions, and those who are new to analytics will benefit from the program. Participants are not required to have a strong math or technical background. Customer Analytics focuses instead on the managerial issues that intersect with analytics, including how best to convey insights from data to decision-makers. Industries that are currently exploiting business analytics include, but are not limited to, consumer packaged goods, financial services, health care/pharmaceuticals, manufacturing, media/communications technology, hardware/software technology, transportation, and logistics. What does customer analytics mean? What does customer analysis mean? Customer analytics involves both understanding the customer journey and then recommending what firms should do based on those insights. There are three parts to customer analytics. The first part is descriptive analytics — visualizing the customer journey using the data that a firm has. The next part is predictive analytics — forecasting what customers will do in the future based on the marketing mix. The last step is prescriptive analytics. This step offers actionable decisions that the firm can make based on understanding the customer journey. Customer analysis can be broadly categorized under predictive analytics. What is consumer behavior analysis? Customer analytics typically involves a deep dive using data on transactions that a customer may have with a particular company. Consumer behavior analysis is a much broader term. For instance, one type of consumer behavioral analysis may focus on customer emotions before and after any purchase. What are the stages a customer goes through when buying a product? The typical framework for describing any purchase decision is the AIDA model – Awareness, Interest, Desire, and Action. The stages a customer goes through when buying a product are very distinctive. The first one is when a customer becomes aware of your product – the awareness stage. This is where advertising can play a role. The next two steps involve consumer learning, wherein the consumer learns about the product and may form a positive disposition towards it. The final stage is making a decision about the purchase – after they’ve looked at all the different products, they decide to purchase one. What are the factors that influence consumer behavior? Managers have to consider many decisions that customers make in terms of whether or not to buy a product. There could, for example, be the social aspect – what are other people buying? Or it could be based on the marketing interventions that a firm carries out to make the customer aware of a product. What are actionable insights? What is actionable intel? What is insight in data analysis? There are two big aspects that everyone thinks about in predictive or descriptive analytics. One is the actual analysis of the data itself, or data analysis. And the second is the more important step: how one can relate the results to actionable insights. Put differently, what can an individual do differently as a manager with the results? Thus, after analyzing the data, the critical step is generating insights and putting them into action. What is descriptive data analysis? Descriptive data analysis is one of the first steps in understanding the customer journey. It’s getting a sense of what the data is like and what it is telling you about customers. An example: one may perform a descriptive analysis of customer transactions in a firm’s database. This analysis might tell you what the most popular products are, which types of customers are buying them, and where they are buying them. What are the outcomes of descriptive analytics? Successful use of descriptive analytics starts with the decision. For example, if your decision involves targeting the most valuable customers, the descriptive analytics outcome should be in “describing” who your most valuable customers are, and the next step would be determining how to find them. In some sense, outcomes are not as important unless they relate to a business decision. What is descriptive analytical method? This is interchangeable with descriptive analytics — broadly speaking, the methods that would help you visualize data. What is the difference between predictive and prescriptive analytics? Predictive and prescriptive analytics are two major aspects of the analytics journey. Predictive analytics follows after descriptive analytics. After you have broadly understood what the customer data is suggesting, the next step is to try to forecast what customers will do in the future. This is the step where one builds a forecasting model. After completing the predictive analytics component, the next step — from the firm’s point of view — is what should they do? In other words, prescriptive analytics basically prescribes optimal actions that a firm should take once it understands what its customers will do in the future. How is predictive analytics used in business? Predictive analytics forms the core of what a business wants to do, which is to be able to forecast what customers are going to be doing in the future. Then the firm can start thinking about many issues, such as customer lifetime value and resource allocation. Thus, predictive analytics forms the backbone of making decisions that rely on understanding how a customer’s journey will proceed in the future and how the firm will be able to shape it, given its marketing resources. What is the goal of prescriptive analytics? The goal of prescriptive analytics, as the word implies, is basically to prescribe actions for firms. To give a concrete example, prescriptive analytics around pricing would include how much a product should be priced. What are predictive modeling techniques? Similar to prescriptive analytics, predictive modeling techniques are a framework that one can use in understanding what customers’ needs will be in the future. The workhorse for predictive modeling technique is a regression-based analysis, which quantifies historical data to make predictions for the future. Prescriptive modeling is a method for ultimately prescribing optimal actions for firms. What is the prescriptive approach? The prescriptive approach is thinking carefully about how one can come up with an outcome that is a very clear action that a firm should take. So, for pricing it would be optimal price, and for advertising it would be optimal level of advertising. It’s any approach that helps firms understand what they should be doing for certain kinds of marketing decisions. What is customer value analysis? Customer value analysis is thinking carefully about the customer’s lifetime value, or a monetary value for the customer. Some questions of general interest are: How does one put a monetary value on the customer base and determine how much each customer is worth? Such valuation can, in turn, help firms understand who their most valuable customers are. How do you increase customer value? The answer to this depends on whether one can link different marketing actions to eventual lifetime value of customers. For a media company, it could be about trying to curate content to appeal to customers and make them more engaged with your company. For other companies, it will revolve around other kinds of marketing actions they engage in. I do independent consulting and I’m currently working with an international communications and marketing agency. I decided to enroll in the Customer Analytics program because I have worked for 14 years in the consulting industry and wanted to better understand what my clients wanted and needed. 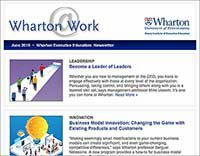 The Wharton program helped me integrate most of my past work experience into one coherent set of skills and gave me a foundation to expand my capabilities. My appreciation for what customers might be looking for has been shifted quite a bit, and I really gained great insights into what it means to work with customers. One major insight that I got from Customer Analytics was that even though human beings can be infinitely complex, their behavioral patterns are actually not that complex when it comes down to the moment of deciding whether to buy something or not. There are a lot of great tools that can help you understand customers’ underlying propensities and past behaviors. Another takeaway was that because there’s so much freedom and reach in what you can do in the online digital space, ethics matter. It’s important not just for people in my role but for users, site operators, and ad agencies. I also gained a better understanding of the larger customer analytics community — marketers, consumers, corporate managers, scientists, and developers — and the part each one plays in this field. The faculty was excellent and the program was well-designed. I felt that they delivered the program at their best. I also had a great time getting to know the other participants during the classes and at lunch and dinner. We ended up building a collective view, a coherent understanding, of a given subject. That kind of thing never happens in a regular work environment, so I really liked that aspect of being in the program. I strongly recommend the course. I would give it a 10 on a scale of 10. As a Wharton alum taking this class, I almost forgot what it would be like to be back at Wharton. It was a reminder of the quality and style of the faculty, and I realized I missed that environment very much: an environment where you get to access the intellect and rigor of those researchers. I also enjoyed being around the staff members and of course the students who come to take the courses. Everything that was covered in Wharton’s Customer Analytics program—from understanding baseline decisions about data to different types of analytics—is relevant for my company. When I came back and presented some of what we learned, my boss said the program already paid for itself several times over. I’ve been through many training programs, but this program was by far the best. The interactions with the professors, all of whom I got to know, and the rest of the class made for a lot of opportunities to learn more, make connections, and network. My company will be sending more people next year." Wharton really goes in depth, not only in the theory but also in tools and strategy. It’s the right combination of the theoretical and the tactical, and you start implementing what you are learning in real time. Many times programs like this take you from A to H. You learn some of what you need but not everything. Customer Analytics goes from A to Z. The professors are fantastic and cover every aspect of the subject. There is no other way to learn this much about customer analytics without going back to school." When you go to a program 3,700 miles away, you must be very sure that it’s going to be a great program in a great business school, and you go with many questions in your mind. Some of my questions were broad, including why we need to change from a product-centric model to a customer-centric one, and why Customer Lifetime Value is a key if you want to be successful in your business. I also came to the program wanting to know more about specific metrics topics such as regression and deviation." Customer Analytics answered all of my questions, and the program has been key for my future in this new world. It was worth every one of the 3,700 miles of travel to study at a great business school with the best teachers and highly-engaged classmates." Everyone reads about Netflix and Amazon doing amazing analytics and making great strides. But they’ve been doing it for a long time with big budgets. Now after attending Customer Analytics, I am confident that as a small company there are things we can do to nudge up to them if we are focused. We don’t have to replicate what they’re doing. By creating our own analytics strategy we can address our challenges and save hundreds of thousands of dollars because of what we are learning. My company is already looking at our offerings and pricing in a new way, and starting to make changes. You can’t get the level of learning and instruction anywhere else. The professors take complex concepts and make you comfortable with them. You leave ready to start using what you learned." Still considering your options? View programs within Marketing & Sales, Strategy & Innovation or use our Program Finder.